We are located in the heart of the city, and our central location allows you for easy access to the bus stations and also most local colectivo stations, main square, museum, restaurants, coffee shops, local and super markets, travel agencies, banks & ATMs, pharmacies/clinics, police station, bars, and much more... all at just a few steps from our door! Our hostel features clean, spacious and comfortable rooms. Our dormitories are clean and spacious and has very comfortable beds, and with their own private bathroom with hot water. Each bed of our dorms has private spaces with curtains. Also, we have private rooms (matrimonial, double and triple). Additionally, we offer free of charge: tea and coffee, common-use kitchen, secure lockers, luggage storage, library, cable TV & DVDs, and Wi-fi access to all of the common areas. From our incredible rooftop terrace, enjoy the sun and beautiful views of the snowing mountains, have fun practising rock climbing on our indoor climbing wall. Or, simply pass the time with our diverse selection of table-top games. Starting at 16:00 until 24:00 midnight is a great time to enjoy a refreshing local beer or cocktail in our rooftop bar and leaf through some books, listen to good music, and meet other travellers. Also, on especially cold nights, sing, dance, and play music around our rooftop bonfire pit. Our location is privileged because we are near to some of the finest attractions and landmarks of the city. 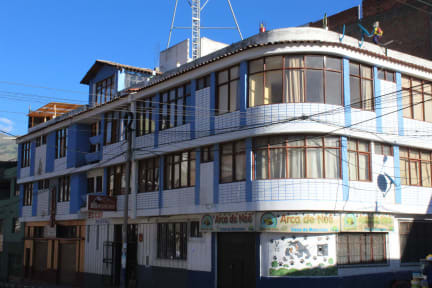 In this sense, from our facilities you can reach in some minutes walking or even less important spots and monuments of the city such as Plaza De Armas Huaraz, Estadio Rosas Pampa, Regional Museum of Ancash and Pumacayan (Resto Arquelogico), amongst other interesting places that the city features. As always, we provide personalized services. So, our professional guides staff are here at to advise and support you in whatever you may need (specially to help you to plan the best choices for your next adventure!). Check in from 12:00 (from 06:00 subject to availability). Check out from 10:00 to 10:30 . Breakfast is served for free.